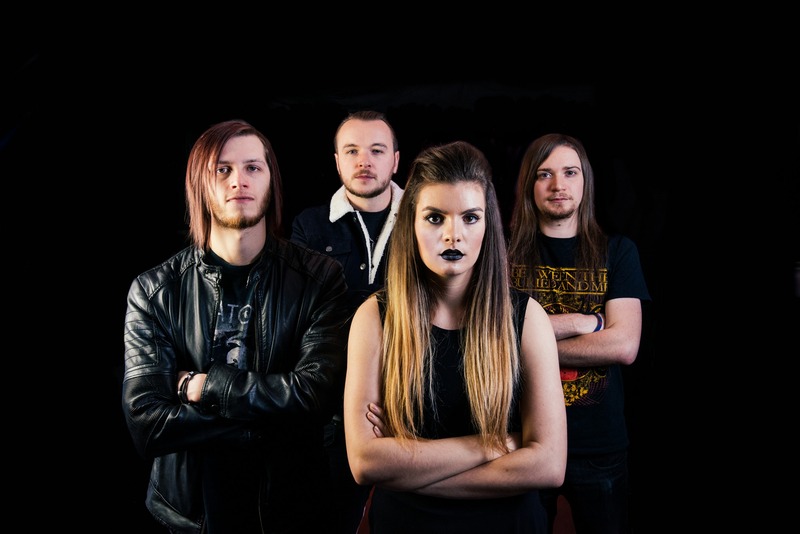 Brit melodic metalcore crew SERTRALINE are geared up for the release of their sophomore EP Guilty, out 3rd March. For now though, we had a chat about the band’s background and beginnings…..
After a couple of line-up changes earlier in the band’s history, we are now as follows; Lizzie Parry on vocals, guitarists Mike Hawkings and Tom Wilson and Dan ‘Hendo’ Henderson on bass. Si Douglas plays drums for us live, and we hope it won’t be long before he is officially announced as a permanent member! Sertraline was born almost immediately after Mike and Dan’s previous band parted ways during the summer of 2014, as a result of their singer calling it a day for good. The rest of the band, dissatisfied, quickly agreed to start from scratch, with brand new music, a new singer, a new name, everything. So instead of feeling glum about the breakup of our band, we were very excited about the prospect of something new for us. We started jamming out new material whilst looking for a new vocalist, very soon being joined by Lizzie. Our ‘birthtown’ Stoke-on-Trent’s live music scene is among the healthiest in the country, and it’s great to be a part of that! There’s also the fact that our current rehearsal space is above a bikers’ den, and across the road from a brothel – that’s just character. The band really came into its own when the first EP was recorded and we worked towards its release. After we parted ways with a couple of members in 2015, the four of us who remained found ourselves becoming a closer and more gelled unit. This has only improved over time, especially when Si began playing with us regularly. Collectively, our influences put emphasis on the heavy, the clever and the melodic. A lot of what influences Lizzie comes in the form of frontmen such as Spencer Sotelo, but also has a penchant for Ariana Grande, and why not! Mike’s influences span from a range of classical music through to bands like Tesseract and Katatonia, and more recently Copenhagen group Vola. These influences are shared by Tom, much of whom’s technique derives from extensive jazz training and being the sole writer for his previous band. Dan’s influences come from along the thrash metal and stoner rock lines, but shares the same love for technical and melodic music, Periphery in particular. Most of us met through pure chance, so we feel like we’ve been very lucky! Mike and Dan met through playing in their previous band. Tom and Lizzie both originate from Leeds, but didn’t know each other before Sertraline. Mike met Tom whilst at Uni, at a house party of course! Lizzie responded to an online advert for a singer, and met everyone for the first time at her audition. Our drummer Si was recruited through a mutual friend. Groovy, heavy, chuggy, rifftastic, melodic, powerful, atmospheric, passionate. Loud. Yes! We will be embarking on another UK tour visiting the following towns/cities: Cardiff, Reading, Newcastle-upon-Tyne, Edinburgh, Pentre, Leeds, Kendal, Birmingham, Stoke-on-Trent and Carlisle. This will be throughout Feb and some of March to support the EP’s release. We’ll be playing our new EP in full, a couple of our already well known songs plus (hopefully) a brand spanking new tune! We’ll be joined by either Elasea or Thesis Lives (date dependent) and we can promise you one hell of a show! Previous Tuska 2017 adds Apocalyptica, Dirkschneider and others to lineup. Next Skindred, Annihilator, Municipal Waste announced for BOA 2017.